Earlier this week, I found this post on pinterest, linking to Poly Clay Corner’s post on what to do with liquid polymer clay. This led me down the rabbithole to this post about faux ceramic. Such a beautiful result! At the same time, I was eyeing my molding material out of the corner of my eye – I’d been waiting for summer to get some real live organics out of my silicon molding putty. So being me, I decided to combine the two ideas! First, a little trip into the back yard for some leaves and tiny flowers and things. It was surprising how many I could find! I thought about it and figured a solid mold would work better for what I was aiming towards, so I pulled out my giant box of white sculpey and went to work. 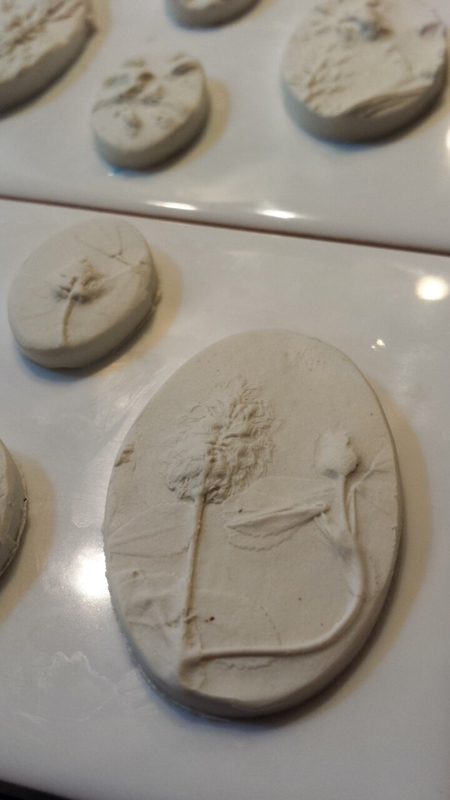 My first attempt at making a mold out of a flower! Some organic material was left in the clay, but who could be mad when this plant came complete with its own curlicues?! 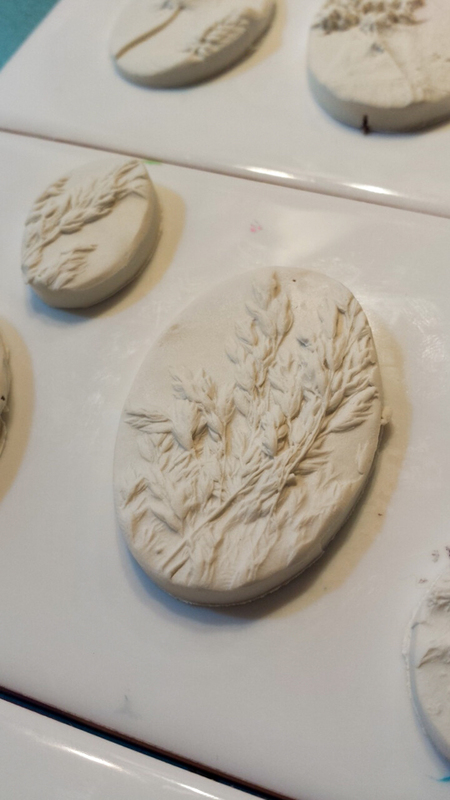 I did up a few different molds, then shoved them in the oven to bake. (Note: I finally got ceramic tiles! The only size was 3×6 but as it turns out – pretty well perfect for this!). I figured I could scrub the organic crap out after they baked. Turns out – only sorta, but eventually the stuff pulled out onto fresh clay anyway. After the molds baked and cooled, I pulled out my Kato liquid clay and started to mix colour into it using a few of the only alcohol inks I had on hand (oh, my poor bank account is going to suffer shortly, I can tell). I used one of my new tiles as a mixing surface, which worked great – for a while. After a bit it started running together, so I used it to just mix new colours. You should have seen the mess after I started making purple and brown and different greens…. But… it was time to start making shapes to paint. So I rolled out some clay, pressed in my stamps, and with delighted squeals I started cutting out ovals, squares, circles, and rectangles, placing them on my mini tiles and putting them aside (so convenient) until I had enough to start painting. And then. The painting. Oh, the painting. It was INSTANTLY addictive. I realized I was going to want to do this until my eyes bled (I pretty much did – immediately upon quitting at 9pm last night, I got a silent migraine aura and couldn’t see). And in that case, I was going to need a LOT more tinted clay. I looked around the studio and found these little food cups from the dollar store, and mixed up a chunk for each of my ink colours. Not a perfect colour wheel, but sure dang close! So far as I know, this stuff doesn’t go bad, or even dry out, since it needs to be baked to set. I was able to spend a LOT of time futzing with my colours and even leaving the brushes out most of the day, they never got hard or gross. A wash in alcohol (since alcohol dissolves polymer clay) cleaned them up. But what am I saying! BACK TO THE PRETTY THINGS. By this point I was hopelessly lost. 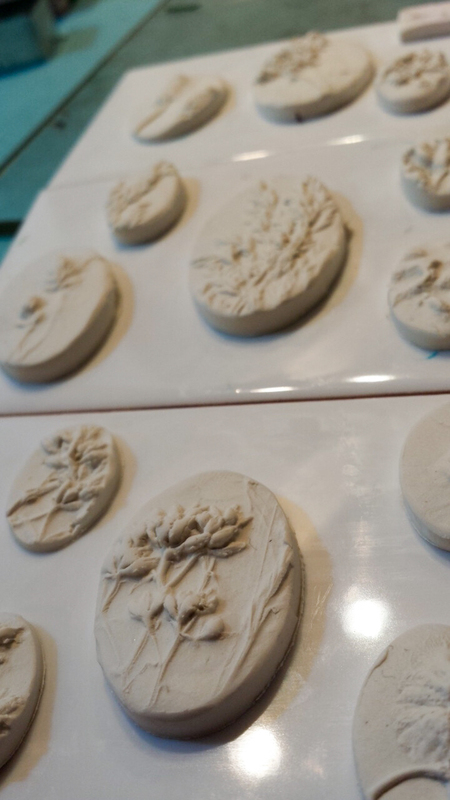 i went back out and got MORE organics and made MORE molds so I could make more different pieces (see, this is why I couldn’t have a tattoo, I’d be a circus freak by the end of the week, covered head to toe in different ones). This second batch was even more exciting than the first. I’d learned a few things along the way of course and while these aren’t perfect, they improved. And look at the super up close detail I was getting out of them! Starting to get the hang of this coloring thing! These all got baked and they have a really beautiful texture – not quite matte, not quite glossy. Soft and lovely under the fingers. On a few of them, I heat set the first layer of colour to avoid bleeding; on others, I WANTED the bleeding. I’m not sure how many trips to the oven I made yesterday but this morning, I wanted MORE. This time I hit the front yard, and I feel like this was the jackpot set of molds. Organics for molds – batch three! I mean really. Look at this! Such detail out of these ones. Last night I found my brushes were all rolling into each other and they kept contaminating the colours. So I quickly rolled up a log and used a brush to make impressions along it, baking it with my last batch of the evening. This morning when I got set up, it was PERFECT. I tried some orange today – it’s not bad, but I can do better. My final pile is exciting and summery. I wish I had another week’s vacation to get these ready to sell! I think I’ll do a 4-strand braid in silver on these. Might make some brooches, definitely some earrings. But without further ado: the final pieces! See how soft and not-quite-matte they are? Gayle, your writing is inspiring. These pieces turned out fantastic and I can’t help but want to try this. I’ll have to add it to my list as I’m doing my nieces wedding at the moment, but wanted to compliment you on this! Can’t wait to see what you do with them!